How many different compacts, palettes, tubes, containers, does your make up collection contain? Ever think about how much waste this is equivalent to? boxx cosmetics founder, Sandra Milligan, did and spent the last 7 years developing a line of cosmetics designed to streamline your make up stash and impact the environment at the same time. The concept is "the boxx", an easy-to-store compact that houses your choice of shades for brows, eyes, lips, cheeks and face. I had the pleasure of chatting with Sandra over a boxx candy bar a few days ago at Petite & Sweet. Anyhow, the make-up stations were full so I didn't have a chance to get done up. The ladies who did looked really fresh. I have to say, this concept makes so much sense! If they had a wider range of shades, I wouldn't question the purchase. Having your pressed powder in the compact has to be super convenient. Think about how easy it would be to tuck into your laptop or weekend bag. Right now the shades are limited for face. I'm crossing fingers that they will expand the line. The largest investment is "the boxx" at $58, but the make-up itself is priced very competitively with popular brands. The line is paraben free, gluten free, not tested on animals, and packed with natural goodness for you skin. The best part is you'll use everything you put inside since you buy what you love. No more palettes with one shadow stealing the show. You can even purchase a storage system to organize your products when you're not using them. So smart! You can find boxx cosmetics locally at Petite & Sweet in Toronto at 420 Summerhill Road or place an order online. Side note: I recommend a trip to this store for really special gifts or delicious macarons this season. 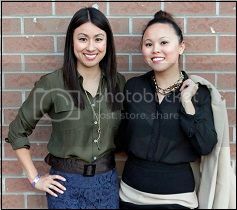 --Tamika Auwai is a fashion junkie, splurge-a-holic, and founder of Shop Socials.